Everybody gets the story this month—Patrons and blog readers and social media followers alike. Everybody. Because I’m the Princess, and I said so. Katy. Simi. Justin. Ursula. Dallas. Kathryn. Bill. An unconscionable amount of good people have left this world since my birthday in January. Want to know the worst part? I feel like I’m forgetting someone. Literally so many people in my life died in the last month that I lost count. I light a lot of candles these days. Katy died on my birthday. Bianca had whisked me away to Paradise City con in Miami by the time I got the news, so there was no time to grieve. Quincy Allen was around that weekend to provide bear hugs whenever I needed. I left the booth to cry in the bathroom the few times Leanna texted me, but I didn’t respond to her. I was not ready for that conversation. I did not want to “talk to anyone.” I had work to do. So I did it. I needed time to think about what sort of farewell I could write to my Audio Dream Girl. I still can’t manage it. There’s just so much to unpack. So much to process. Too much. And now, several weeks later, we’re four or five deaths down the line. I feel this way in my career sometimes. The to-do list becomes overwhelming and I don’t know where to start. Logic dictates that I begin with the first item on the list. But that’s not always the thing “speaks to me,” as Sherri Kenyon is so fond of saying. Bianca and I were at Orlando Toy & Comic Con when Kathryn went into the hospital. That con only lasted one day, so I was home when she didn’t make it through the second round of surgery. I had time to pray for Kathryn. I had time to grieve. I had time to cry, and scream at the world, and cry again. I cried a lot. I cried so hard that Tempest came in the room and just hugged me for a while. I told her how mad I was…and how I didn’t feel like I even had the right to be weeping over Kathryn, since I hadn’t had the time to properly grieve for Katy yet. She was right, of course. I so desperately wanted to apply logic to this whole situation. But Feelings took Logic and laughed maniacally while tossing it out the window. But that’s me in a nutshell, isn’t it? The perfect fictional offspring of Mr. Spock and Deanna Troi. Though lately I’ve been wondering if I’m going to evolve into the Mad Hatter instead. Maybe I already have. I don’t know what to say about Kathryn yet either—as Leanna pointed out this morning, we’ll probably have to wait for Dragon Con for those words and feelings to make themselves known to both of us. Kathryn’s spirit will be with us in the Green Room, no doubt about that. But Bill…I do have a story about Bill. A funny story. A story that pertains to writing. So everybody gets the story this month—Patrons and blog readers and social media followers—EVERYBODY. And to hell with logic. Because I said so. AlphaOops: The Day Z Went First released in the summer of 2006. My very first “appearance” was an official Author Event at Ingram. I’d been an Ingram Book Buyer for six years at that point, and I had attended every Author Event. Every single one. Being able to meet bestselling and debut authors from all walks of life, each at varying stages in their careers—it was the publishing education I never had. I also made a lot of friends at Ingram in those six years. I was known far and wide for the Happy Holidays mix-CD I made every December and inter-officed to just about everyone in the company. I learned that the more friends one had at a giant corporation like Ingram, the faster one could get things done. So I made a lot of friends. And I did a lot of things. It was incredible amounts of fun. I was the Miss Congeniality of Bookville. One of those friends was Susan, the woman in charge of Author Events. The day before my AlphaOops appearance, we had a very important conversation. Post-its are a very important thing at Author Events. After the author gives his or her talk, the audience lines up to get their books signed. (Everyone in the audience at Ingram receives a signed book.) One person stands ahead of the signing table, armed with a pad of Post-its. They ask, “Who would you like the book signed to?” They write the name down, spell it properly, and stick it opposite the title page. In elementary school I was known as “The girl who stars in every play and that PBS show on TV.” People often know my name, but I don’t always know theirs. It’s the down side of a reputation that precedes you. There were going to be a bunch of people at this Author Event who knew me, but whose names I didn’t know, or who I blanked out on in the heat of OMGBOOKSIGNING. (To this day, I still ask my best friends how to spell their names when signing their books.) I had nightmares of scores of people saying, “Just sign this to me,” as I sat there with zero clue as to who they were. I knew it was going to happen. I just KNEW. So I tried to prepare myself the best way possible: with Susan. “I’m on it,” she said. I had one of most well-attended Author Events in Ingram history. Bigger than Johnnie Cochran. Bigger than Dave Ramsey. Bigger than Al and Tipper Gore. There was standing room only, and people out the door. I told the story of AlphaOops, how it came to be, and how the title was originally The Telaphab from Z to A. “My poor mom and I made so many beaded bracelets with the word ‘TELAPHAB’ on them,” I lamented, and about fifteen people across the auditorium raised their hands. They were all wearing TELAPHAB bracelets. I was so touched, I almost cried. But I didn’t, because I had work to do. After the round of thunderous applause I walked over to the signing table, already piled high with books. Susan stood at the ready, armed with Post-its and a smile, and we made that signing happen. I signed over a hundred and fifty books that afternoon, and I spelled everyone’s name correctly. Later that day, flush with triumph and riding high on the wave of a job well done, I grinned as one of the artists from the ad department stopped by my desk. “Of course!” I said chipperly, taking out my signing pens. But inside I was freaking out. Because I had no clue what this guy’s name was. Book Buyers had no business in the ad department, and the artists almost never left their magical, dimly-lit caves lined with twinkle lights. I recognized him, of course—he was the tall, handsome, really nice one. But what was his name?? I tried to remember where we might’ve met, or at what company function I had seen him last. Nothing. Nothing. “To whom shall I sign it?” If I was really lucky, the book would be for his daughter or something. I opened the book and uncapped a marker. My hand hovered over the page as if I were trying to conjure the perfect inscription. What went through my mind instead was actually a lot of cursing, followed by HOW THE HECK DO I GET OUT OF THIS??? I couldn’t sign this man’s book. I couldn’t. I was just going to have to own up to my ignorance. “How do you spell that again?” I asked sheepishly. Oh my god, I freaking knew that. I mean, I didn’t know, but I knew. And now I was just embarrassed. I felt my cheeks flush all over again as I bent over to sign the page. “Well, hey, Bil Keane only has one L,” I blurted awkwardly. Bill Elliott was an artist. He’d know exactly who Bil Keane was. Score one for the nerd girl who read everything she could get her hands on: every single TV guide article, cereal box, and newspaper comic strip—including The Family Circus. I didn’t have a lot of interactions with Bill after that, but I never forgot him after that day. I made sure he got a Happy Holiday CD every year, and every year I was the recipient of one of his original Christmas cards, even after I left the company. 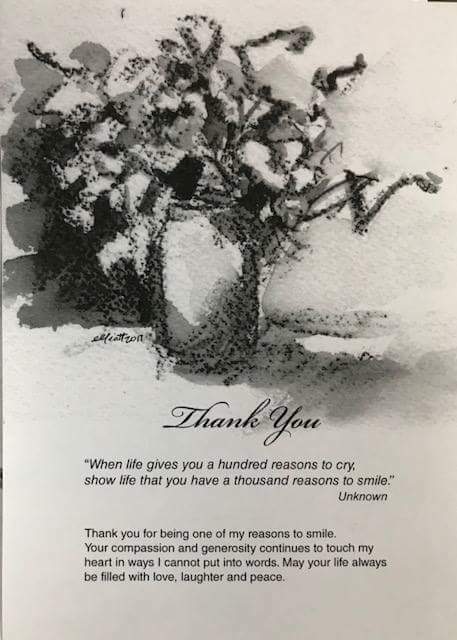 When Bill was sent home to rest, before the cancer snapped back with a vengeance that surprised even his doctors, Bill drew a new card to thank all of his friends and family for the support they had shown him during his illness. But Bill’s message of thanks is universal—it’s what I would say to all of you—my friends, my family—who have supported my artistic endeavors in the past and who continue to support me still. Thank you for being one of my reasons to smile. Your compassion and generosity continue to touch my heart in ways I cannot put into words. May your life always be filled with love, laughter, and peace. I love you all—every single one of you—right down the the bottom of my illogical, overly-emotional, crazy-filled, tea-drinking heart. I will be writing a follow-up essay for my Royal Scholars (after I stop crying) that includes some tips on how to deal with the “Just make it out to me” situation, from both sides of the signing table. If you are not yet a Patron of the Wonderful World of Princess Alethea, I highly encourage you to come join the fun! This entry was written by Princess Alethea and posted on February 21, 2018 at 7:00 am and filed under appearances, Friends, life, tennessee, writing. Bookmark the permalink. Follow any comments here with the RSS feed for this post.